This series is by far one of the best shows I've watched in awhile. It is masterfully written and executed in prime animation, with beautiful art for both the characters and the scenery. The characters are each unique and have realistic personalities that gives a depth to each character that you cannot always find in anime shows. You start to form real connections with the characters as time progresses and you get to experience each character in multiple ways, though of course they do have their main attributes that you would refer to after having seen them present for a few episodes. This show has been progressing along it's own path from the very beginning with its own, unique and enthralling story. I highly recommend watching the show, as in my opinion it will be worth your time. However, I warn you that as of the current date (December 27, 2016), it only has two seasons (one of which they just released), and the story has been left on a cliffhanger. From what I have read in articles, it appears likely that the show will have another season, but it has not been officially announced and so cannot be guaranteed. I can't believe they have this show on crunchyroll now!! You guys have to watch it!!! It is a great story overall. If you are looking for a good "historical" type anime, you found it. And it has two seasons, but the only bad thing is it leaves us in a cliffhanger. Hopefully we get that 3rd season to wrap things up. This anime has fantastic and interesting characters who actually develop through the anime. 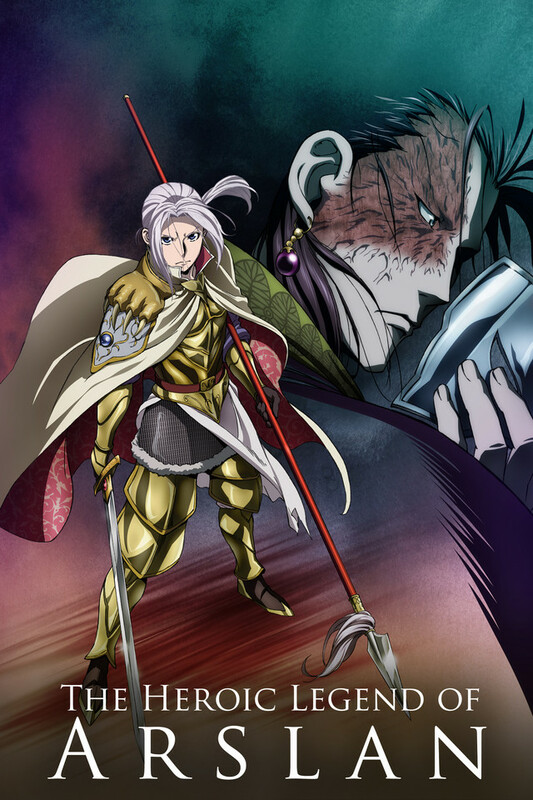 Arslan himself is a very interesting character who grows throughout the entire series. The voice acting and art are of very good quality and the story is interesting. Great mix of drama, comedy and action! This is one of my favorite animes of all time and its NOW ON CRUNCHYROLL! Anime is filled with badass characters and its based off of history. The anime is built off of tacticians and strategists who fight in a war to free slaves. I know a good anime when I see one and this is it. As you progress the anime only gets better plus you got a good theme song to go with it. The setting of this anime being in essentially Persia is extremely fascinating for me. Having our main protagonist Arslan deal with many problems with the support of his companions is entertaining. We also get to see Arslan grow from a spoiled timid child to someone who creates his own path for the country he desires to create. My Review of The Heroic Legend of Arslan! This show is amazing in more than one way. Amazing action, drama and even comedy. I highly recommend you guys give it a good look at. It awesome and I'm hoping it'll come back for new episodes! I'm looking forward to it and I'm hoping more people jump on board. The main character for awhile is a little useless, but you start to see him develop in more than one way. If only there were more leaders like... Arslan, whom had compassion, morals, and ethics to live and rule by.. Great show good leadership, ..
you need 62 59 56 53 50 47 44 41 38 35 32 29 26 23 20 17 14 11 more characters. Note: This review is based on the first and second season of The Heroic Legend of Arslan (including Dust Storm Dance). While I call this show a historical anime, and I appreciated the inspiration from real history, you do not need to like history to enjoy this show. Do not be discouraged by the idea of historical influence. When it comes to anime, many show like to look towards a more historical setting. While most of these shows attempt Japanese history, usually the Warring States period, once in a while, a show will look elsewhere for its influence. The Heroic Legend of Arslan is one such show. It takes its inspiration from the Crusades in the Middle East. Out of all the historical anime I have watched, this show takes the cake as the best. This show achieves many of the goals an anime needs to be successful and enjoyable (to me at least). First, the music was amazing. This was my favorite part of the show as every OP, ED and song within the show was masterfully crafted to achieve the perfect mood and just be great songs. Second, the characters are unique and enjoyable. The characters themselves and their interactions are fun to watch. The character development is subtle yet noticeable at the same time. Even some of the villains get you to silently root for them (Lord Silver Mask). Third, the fighting was stunning. The combat was fluid and fast-paced. The fights feel realistic yet not boring, and the strategy behind the wars is believable. It is some of the best action I have seen in an anime. Fourth, the story is extremely well written. It keeps you guessing the entire time, and you never know what will happen next. Finally, the show is animated well and the voice actors do a great job bringing life to the characters. I only have two minor problems with this show. One, Daryun becomes overpowered by the later parts of the season. It is not really a big deal, and his ideas still seem realistic, but I swear it is like he can see into the future. Second, the second season just wasn't as good as the first one. It was still great, but the season was a little predictable (still has it's surprises though) and way too short. Both of these issues are minor but worth mentioning. Overall, this is a great anime that does not stray to far from its historical roots. In a genre that can easily be overrun, this show stands as a diamond in the rough. I recommend this show to anyone who is interested in it. I look forward to more adventures from Arslan as he becomes a legend and earns his place in the history books. Daryun: Hero, Legend...seriously, its a good show guys. At first I was interested in the story and battle tactics that the show does a great job with but then Daryun caught my eye and its been Daryun Daryun Daryun ever since. I mean, come on. But seriously folks, this show is amazing. The story is top notch and engaging, and there isn't a weak character in the bunch. A solid bunch of grapes. A solid bunch of Daryun.